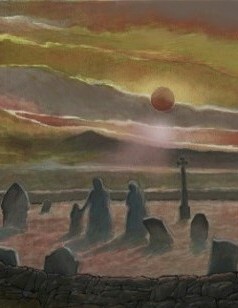 A graveyard in the Outer Hebrides. The leafy suburbs of Oxford. The Black Cuillin ridge. A strange museum in Iceland. A Manx fairy glen. A deserted Scottish isle. A Welsh woodland mansion. A haunted cottage on Skye. A pagan site on the Wirral Peninsula. A forbidden estate on Mull. These are the settings for excursions into the uncanny. They are largely inspired by real places where the author has felt a nuance of, in that inimitable German word, the Unheimlich. A fabulous new collection of ten tales (six previously unpublished*) from the author of A Certain Slant of Light and Phantasms (both Sarob Press) and Strange Epiphanies (The Swan River Press) is sure to hit the right note with aficionados of the supernatural tale. And the previously published “The Executioner”, “The Island” & “Sithean” have been substantially re-written for this volume. Foreword by the Author and a superbly atmospheric wrap jacket painting by the ever brilliant Paul Lowe. REVENANTS & MALEDICTIONS is a Hand Numbered Limited Edition Jacketed Hardcover. Publication currently scheduled for early June 2018.